Status: Inactive; Active 1970-1986. Born: 1942-05-13. Spaceflights: 5 . Total time in space: 145.66 days. Birth Place: Iskander, Tashkent. Graduated from Higher Military Fighter Pilot School, Yeysk, 1965 Major General, Soviet Air Force. 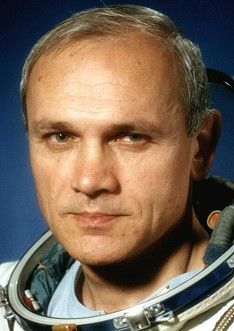 First Soviet cosmonaut to fly in space five times. Two EVA's, total time 0.36 days. Deputy head of TsPK from 1984 to 1986. As of 1999 he was a scientific consultant to TsPK. In retirement took up hot-air ballooning. Birth name: Krysin. Call sign: Pamir (Pamirs). Family: Cosmonaut. Country: Russia, Uzbekistan. Spacecraft: Salyut 6, Salyut 7. Flights: Soyuz 16, Soyuz 19 (ASTP), Soyuz 26A, Soyuz 27, Soyuz 36, Soyuz 39, Soyuz T-6, Soyuz T-12, Soyuz T-13 EO-4-a, Soyuz T-13 EO-4-b. Projects: ASTP. Agency: VVS. Bibliography: 4452, 5347. 1942 May 13 - . Birth of Vladimir Aleksandrovich Dzhanibekov - . Nation: Russia. Related Persons: Dzhanibekov. Russian pilot cosmonaut 1970-1986. 5 spaceflights, 145.7 days in space. Flew to orbit on Soyuz 27 (1978), Soyuz 39, Soyuz T-6, Soyuz T-12, Soyuz T-13..
1974 December 2 - . 09:40 GMT - . Launch Site: Baikonur. Launch Complex: Baikonur LC1. LV Family: R-7. Launch Vehicle: Soyuz-U. Soyuz 16 - . Call Sign: Buran (Snowstorm ). Crew: Filipchenko, Rukavishnikov. Backup Crew: Andreyev, Dzhanibekov. Support Crew: Ivanchenkov, Romanenko. Payload: Soyuz ASTP s/n 73-EPSA. Mass: 6,800 kg (14,900 lb). Nation: Russia. Agency: MOM. Program: ASTP. Class: Manned. Type: Manned spacecraft. Flight: Soyuz 16. Spacecraft Bus: Soyuz. Spacecraft: Soyuz 7K-TM. Duration: 5.93 days. Decay Date: 1974-12-08 . USAF Sat Cat: 7561 . COSPAR: 1974-096A. Apogee: 291 km (180 mi). Perigee: 184 km (114 mi). Inclination: 51.80 deg. Period: 89.20 min. ASTP Manned Test Flight. Check-out of the Soyuz space craft's on-board systems which had been modernized to meet the requirements of the 1975 joint flight in accordance with the programme of the Soviet-United States experiment; conduct of scientific and technical investigations. Soyuz 26A (cancelled) - . Crew: Dzhanibekov, Kolodin. Backup Crew: Lazarev, Makarov. Nation: Russia. Program: Salyut. Flight: Soyuz 26A. Spacecraft Bus: Soyuz. Spacecraft: Soyuz 7K-T. Planned mission to Salyut 6 that would make first docking with rear docking port and be the first crew to swap spacecraft and return in the spacecraft that ferried the Soyuz 25 crew. But after Soyuz 25 failed to dock with Salyut 6 and Soyuz 26 as finally flown had quite a different crew and mission profile. 1978 January 10 - . 12:26 GMT - . Launch Site: Baikonur. Launch Complex: Baikonur LC1. LV Family: R-7. Launch Vehicle: Soyuz-U. Soyuz 27 - . Call Sign: Pamir (Pamir mountains). Crew: Dzhanibekov, Makarov. Backup Crew: Ivanchenkov, Kovalyonok. Payload: Soyuz 7K-T s/n 44. Mass: 6,800 kg (14,900 lb). Nation: Russia. Agency: MOM. Program: Salyut 6. Class: Manned. Type: Manned spacecraft. Flight: Soyuz 26, Soyuz 27. Spacecraft Bus: Soyuz. Spacecraft: Soyuz 7K-T. Duration: 64.95 days. Decay Date: 1978-03-16 . USAF Sat Cat: 10560 . COSPAR: 1978-003A. Apogee: 237 km (147 mi). Perigee: 190 km (110 mi). Inclination: 51.70 deg. Period: 88.70 min. Manned two crew. Carried Oleg Makarov, Vladimir Dzhanibekov to Salyut 6; returned crew of Soyuz 26 to Earth. Docked with Salyut 6.. Landing of Soyuz 26 - . Return Crew: Dzhanibekov, Makarov. Nation: Russia. Related Persons: Dzhanibekov, Makarov. Program: Salyut 6. Flight: Soyuz 26, Soyuz 27. Soyuz 26 landed at 11:25 GMT with the crew of Dzhanibekov and Makarov aboard..
1980 May 26 - . 18:20 GMT - . Launch Site: Baikonur. Launch Complex: Baikonur LC31. LV Family: R-7. Launch Vehicle: Soyuz-U. Soyuz 36 - . Call Sign: Orion (Orion ). Crew: Farkas, Kubasov. Backup Crew: Dzhanibekov, Magyari. Payload: Soyuz 7K-T s/n 52. Mass: 6,800 kg (14,900 lb). Nation: Russia. Agency: MOM. Program: Salyut 6. Class: Manned. Type: Manned spacecraft. Flight: Soyuz 35, Soyuz 36. Spacecraft Bus: Soyuz. Spacecraft: Soyuz 7K-T. Duration: 65.87 days. Decay Date: 1980-07-31 . USAF Sat Cat: 11811 . COSPAR: 1980-041A. Apogee: 263 km (163 mi). Perigee: 190 km (110 mi). Inclination: 51.60 deg. Period: 89.00 min. Transported the fifth international crew under the INTERCOSMOS programme, comprising V N Kubasov (USSR) and B Farkas (Hungary) to the Salyut-6 station to carry out scientific research and experiments..
1981 March 22 - . 14:58 GMT - . Launch Site: Baikonur. Launch Complex: Baikonur LC31. LV Family: R-7. Launch Vehicle: Soyuz-U. Soyuz 39 - . Call Sign: Pamir (Pamir mountains). Crew: Dzhanibekov, Gurragcha. Backup Crew: Ganzorig, Lyakhov. Payload: Soyuz 7K-T s/n 55. Mass: 6,800 kg (14,900 lb). Nation: Russia. Agency: MOM. Program: Salyut 6. Class: Manned. Type: Manned spacecraft. Flight: Soyuz 39, Soyuz T-4. Spacecraft Bus: Soyuz. Spacecraft: Soyuz 7K-T. Duration: 7.86 days. Decay Date: 1981-03-30 . USAF Sat Cat: 12366 . COSPAR: 1981-029A. Apogee: 249 km (154 mi). Perigee: 198 km (123 mi). Inclination: 51.80 deg. Period: 88.90 min. Manned two crew. Docked with Salyut 6. Transported to the Salyut-6 orbital station the eighth international crew under the INTERCOSMOS programme, comprising V A Dzhanibekov (USSR) and Z. Gurragchi (Mongolian People's Republic) to conduct scientific investigations and experiments. 1981 March 30 - . Landing of Soyuz 39 - . Return Crew: Dzhanibekov, Gurragcha. Nation: Russia. Related Persons: Dzhanibekov, Gurragcha. Program: Salyut 6. Flight: Soyuz 39, Soyuz T-4. Soyuz 39 landed at 11:41 GMT. .
1982 July 2 - . Landing of Soyuz T-6 - . Return Crew: Chretien, Dzhanibekov, Ivanchenkov. Nation: Russia. Related Persons: Chretien, Dzhanibekov, Ivanchenkov. Program: Salyut 7. Flight: Soyuz T-5, Soyuz T-6. Soyuz T-6 landed at 14:19 GMT. .
1984 July 17 - . 17:40 GMT - . Launch Site: Baikonur. Launch Complex: Baikonur LC31. LV Family: R-7. Launch Vehicle: Soyuz-U2. Soyuz T-12 - . Call Sign: Pamir (Pamir mountains). Crew: Dzhanibekov, Savitskaya, Volk. Backup Crew: Ivanova, Savinykh, Vasyutin. Payload: Soyuz T s/n 18L. Mass: 7,020 kg (15,470 lb). Nation: Russia. Agency: MOM. Program: Salyut 7. Class: Manned. Type: Manned spacecraft. Flight: Soyuz T-10, Soyuz T-12. Spacecraft Bus: Soyuz. Spacecraft: Soyuz T. Duration: 11.80 days. Decay Date: 1984-07-29 . USAF Sat Cat: 15119 . COSPAR: 1984-073A. Apogee: 218 km (135 mi). Perigee: 192 km (119 mi). Inclination: 51.60 deg. Period: 88.60 min. Docked with Salyut 7. Transported a crew comprising ship's commander V A Dzhanibekov, flight engineer S E Savitskaya and cosmonaut-research I P Volk to the Salyut-7 orbital station to conduct scientific and technical studies and experiments..
1984 July 25 - . 14:55 GMT - . EVA Salyut 7 EP-4-1 - . Crew: Dzhanibekov, Savitskaya. EVA Duration: 0.15 days. Nation: Russia. Related Persons: Dzhanibekov, Savitskaya. Program: Salyut 7. Class: Manned. Type: Manned space station. Flight: Soyuz T-10, Soyuz T-12. Spacecraft Bus: Almaz. Spacecraft: Salyut 7. Conducted welding experiments..
1984 July 29 - . Landing of Soyuz T-12 - . Return Crew: Dzhanibekov, Savitskaya, Volk. Nation: Russia. Related Persons: Dzhanibekov, Savitskaya, Volk. Program: Salyut 7. Flight: Soyuz T-10, Soyuz T-12. Soyuz T-12 landed at 12:55 GMT. .
1985 June 6 - . 06:39 GMT - . Launch Site: Baikonur. Launch Complex: Baikonur LC1. LV Family: R-7. Launch Vehicle: Soyuz-U2. Soyuz T-13 - . Call Sign: Pamir (Pamir mountains). Crew: Dzhanibekov, Savinykh. Backup Crew: Aleksandrov, Popov. Payload: Soyuz T s/n 19L. Mass: 6,850 kg (15,100 lb). Nation: Russia. Agency: MOM. Program: Salyut 7. Class: Manned. Type: Manned spacecraft. Flight: Soyuz T-13 EO-4-a, Soyuz T-13 EO-4-b. Spacecraft Bus: Soyuz. Spacecraft: Soyuz T. Duration: 112.13 days. Decay Date: 1985-09-26 . USAF Sat Cat: 15804 . COSPAR: 1985-043A. Apogee: 222 km (137 mi). Perigee: 198 km (123 mi). Inclination: 51.60 deg. Period: 88.70 min. Docked with Salyut 7. Delivered to the Salyut-7 orbital station a crew consisting of flight commander V A Dzhanibekov and flight engineer V P Savinykh to carry out emergency repairs to inert Salyut 7 station and to conduct scientific and technical research and experiments. 1985 August 2 - . 07:15 GMT - . EVA Salyut 7 EO-4-1 - . Crew: Dzhanibekov, Savinykh. EVA Duration: 0.21 days. Nation: Russia. Related Persons: Dzhanibekov, Savinykh. Program: Salyut 7. Class: Manned. Type: Manned space station. Flight: Soyuz T-13 EO-4-a, Soyuz T-13 EO-4-b. Spacecraft: Mir. Installed solar array..
1985 September 26 - . Landing of Soyuz T-13 - . Return Crew: Dzhanibekov, Grechko. Nation: Russia. Related Persons: Dzhanibekov, Grechko. Program: Salyut 7. Flight: Soyuz T-13 EO-4-a, Soyuz T-13 EO-4-b, Soyuz T-14 EO-4-c, Soyuz T-14 Salyut 7 EP-5. Soyuz T-13 landed at 09:51 GMT with the crew of Dzhanibekov and Grechko aboard..